In collaboration with, Joël Chevrier (professor of physics at the Grenoble Alpes University), Anne Dubos (anthropologist and transmedia artist), Loïc Lobet (designer), and Florent Deloison (artist and developper), we proposed a two-week workshop on Smartphones and Movement at the ENSCI – Les Ateliers design school. The workshop united a group of about twenty students who worked in small groups on the design of different projets including performances, installations, and gadgets involving smartphones in motion, as well as concepts of controlling common smartphone applications through movements. Here are some of the projets developed during the workshop. 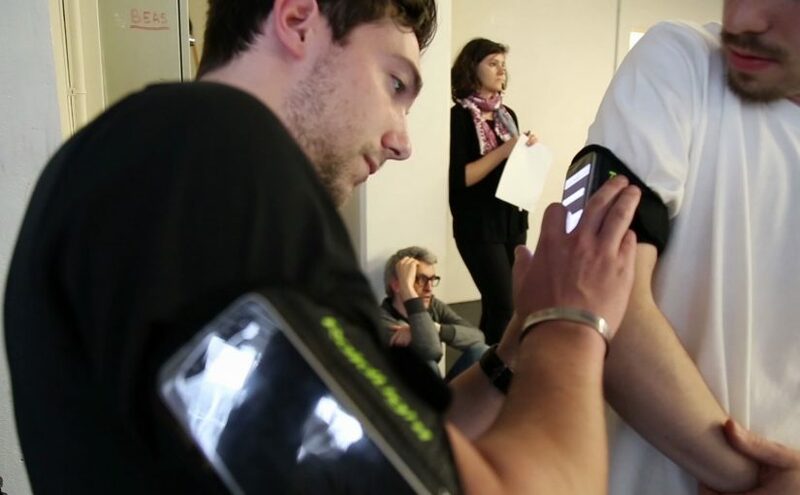 Physical Player is a performance for three performers wearing mobile devices on their arm. 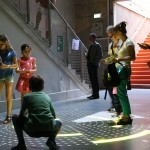 The performers move in a large space interpreting trajectories and symbols marked on the floor. Their motion induces events and changes of sound and music environment rendered through loudspeakers distributed in the space. 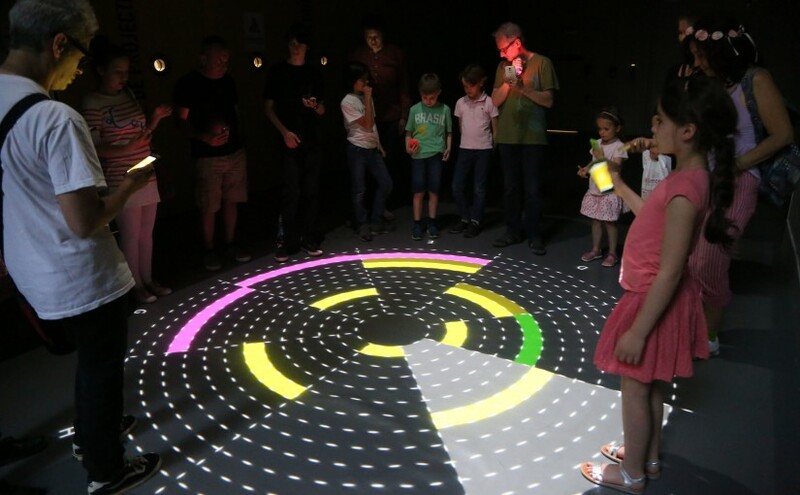 The mobile devices analyse the performers’ movements distinguishing different states like standing still, walking, running (fast and slow), jumping, and somersault to control three different tracks of an interactive audio player. 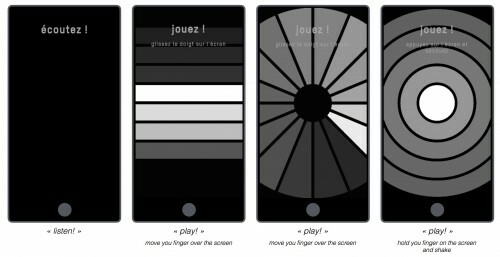 Sorcières is a performance that integrates some of the interactive web audio applications we created at the beginning the CoSiMa project (see apps.cosima.ircam.fr/checks). 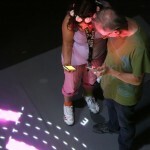 During the performance, the performers invite the public to join their choreography and to produce sound with their smartphones. The project The Little Plane transforms a smartphone into a toy that makes sound when it is moved. 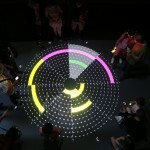 In addition, the toy can analyse and display the motion data trajectories and can communicate them to a public display. 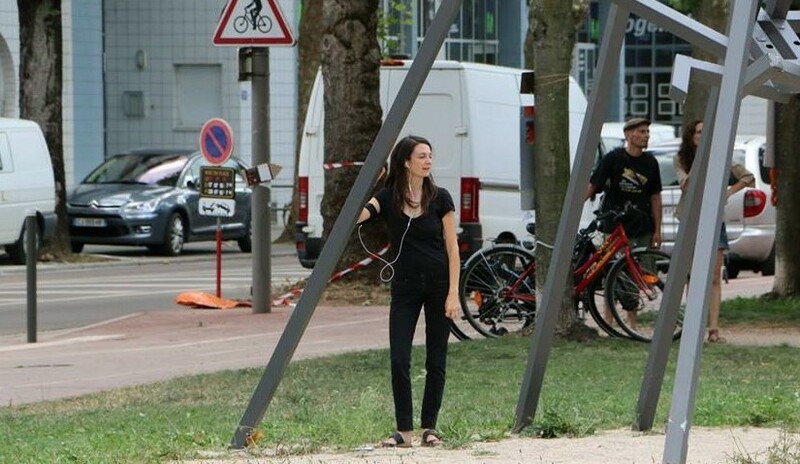 Obviously, the plane could be a car, a boat, a train or anything else that makes sound when it moves. 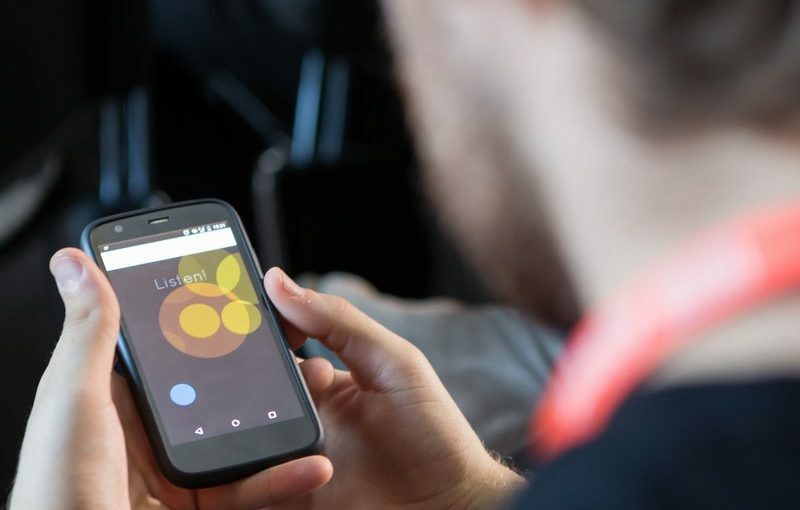 The Scorpion web application transforms subtile motion and vibrations into sound. 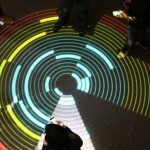 The applications has been used by the students to create a tactile sound installation. 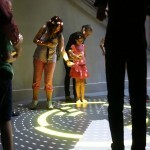 The application has also been used in « L’Atelier tactile », a playground for little children created by Marion Voillot. 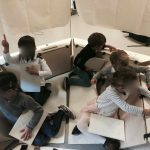 In this scenario, the children search – by carefully touching and listening – for objects (i.e. 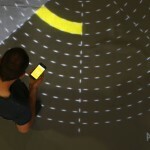 mobile devices) that generate sound and light hidden in fabrics of different textures embedded into a wooden structure. Another follow-up project of the ENSCI workshop was an application dedicated to little children created in collaboration with Marion Voillot. 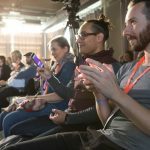 The application supports a scenario of storytelling where children accompany different parts of a story with different gestures that are translated into sound by smartphones they hold in their hands. The movements and sounds evoke actions and motion that occur in the story (i.e. swimming, wading trough water, pushing aside the scrub, wind over a meadow, storm) and where chosen to stimulate the children’s imagination, but also to reinforce coordination, memory, and listening. 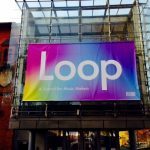 A second version of the Collective Loops installation has been shown during the Ircam Forum Workshops on November 25 and 26, 2015. 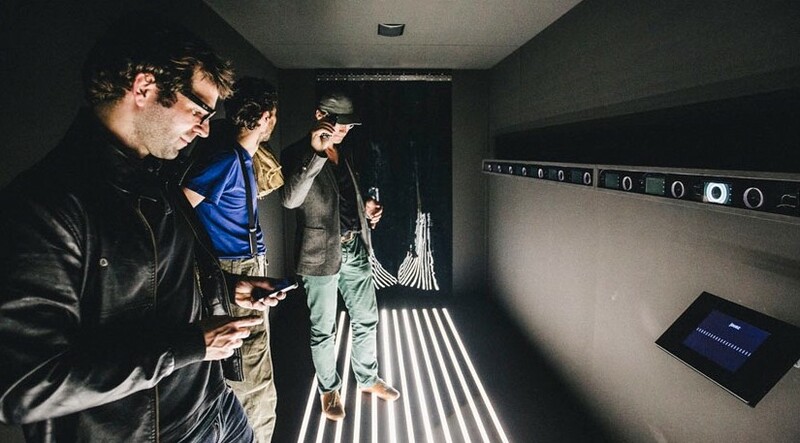 The installation features a collaborative version of a step sequencer that uses the visitor’s smartphones to produce sound. 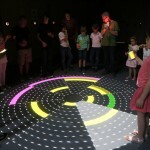 The sequencer is graphically represented by a circle of 8 sectors projected on the floor. The sectors light up in a clockwise motion following the beats of the sequence. When the players connect to the installation through a web page, they choose an available sector, and thus, their step in the loop. The players can control the sounds (i.e. 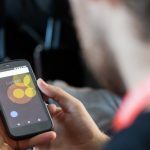 notes in a melody or bass line and percussion sounds) that are played on their smartphone at the corresponding beat of the sequence through a simple graphical interface on their smartphones. 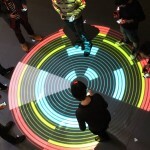 The selected sounds are also displayed in the corresponding sector of the circle on the floor. 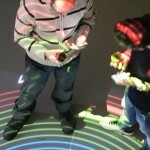 Positioned around the circle, the players collaborate on creating melodies and rhythm patterns rendered through their smartphones. The application uses a first complete version of the CoSiMa platform entirely based on web standards. We did it again. 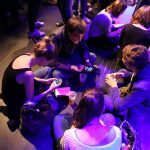 After the Fete de la musique, the Chloe × Ircam concert came to the Nuit Blanche at the Gaïté Lyrique invited by I Love Transmedia. This video summarizes the concert from a rather technical point of view. 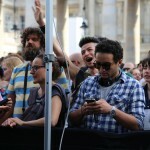 Like at the Fete de la musique, the audience participates in this concert by connecting their smartphones to the local Wi-Fi network Chloe × Ircam and by opening the web page chloe.ircam.fr in their browser. Once connected, the participants are asked to indicate their approximate position on map of the concert space. 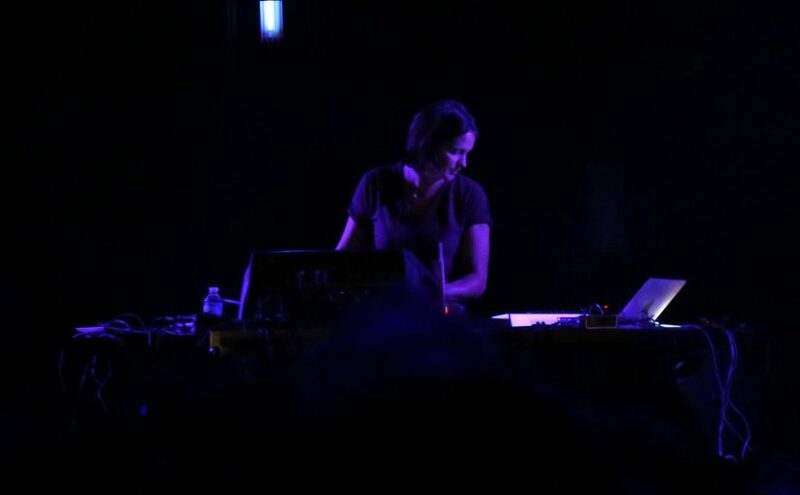 During the concert, Chloé can move sounds over the audience’s smartphones – using four tablets integrated into her setting – and let appear dedicated sound interfaces on the touchscreens. The concert starts and ends with everybody playing with Chloé’s whispering voice. 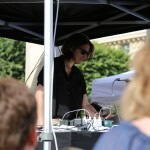 More images of the concert are published on Chloé’s web site. 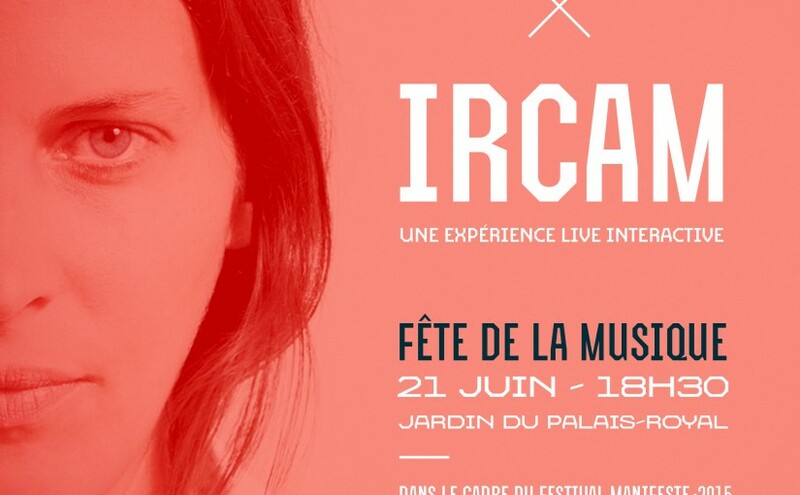 The French Ministère de la culture et de la communication asked IRCAM to imagine a participative concert for the Fête de la musique ’15, whose theme was « Vivre ensemble la musique » (“To live music together”). 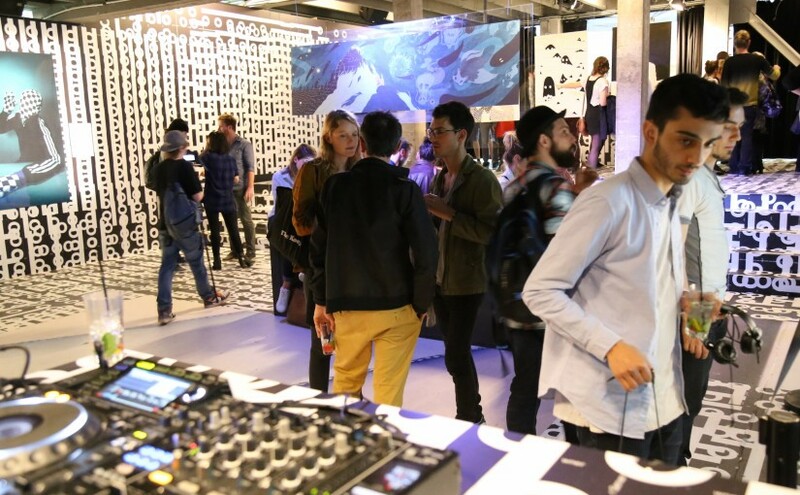 We partnered with Chloé in order to design the interactive live experience Chloé × Ircam. 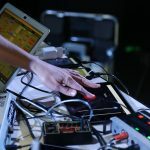 During that experience, Chloé alternates between moments when she plays alone — partially distributing sound on the audience’s smartphones —, and moments when she leaves room for the audience to play with her using their smartphones, thus enabling a musical dialog between her and the audience. 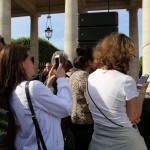 The concert took place on June 21st at the Jardin du Palais-Royal in Paris. 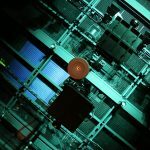 At the beginning of the concert, participants are invited to join a WiFi network and connect to a URL (chloe.ircam.fr). 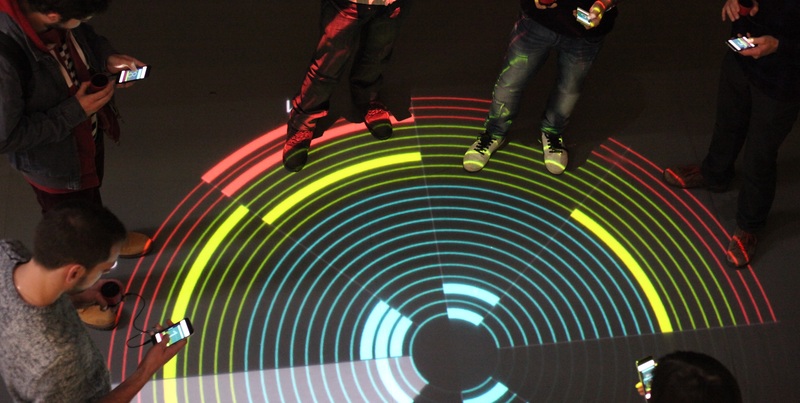 After they indicate their positions in the venue thanks to a simple interface, the experience can begin. 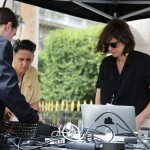 In addition to her usual live electronics setup, Chloé has four tablets where each participant shows up as a circle at the indicated position. Touching these circles she can play different sound textures on the participants’ smartphones. When moving her fingers over the touch screens the sound textures move over the space of the audience. On an additional tablet, Chloé can enable four different interfaces (i.e. 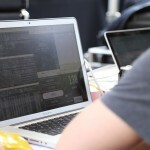 simple instruments) on the participants’ devices that they can play by touching the screen and shaking the device. 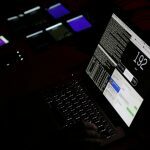 The preparation of this project took three months, during which we made two live tests, one at IRCAM in the beginning of May with around 30 colleagues and friends, and one at the Centre Pompidou on June 9 with over 150 participants. Rone was invited to unveil the universe he created for his latest album Créatures at the Palais de Tokyo (Le Point Perché). 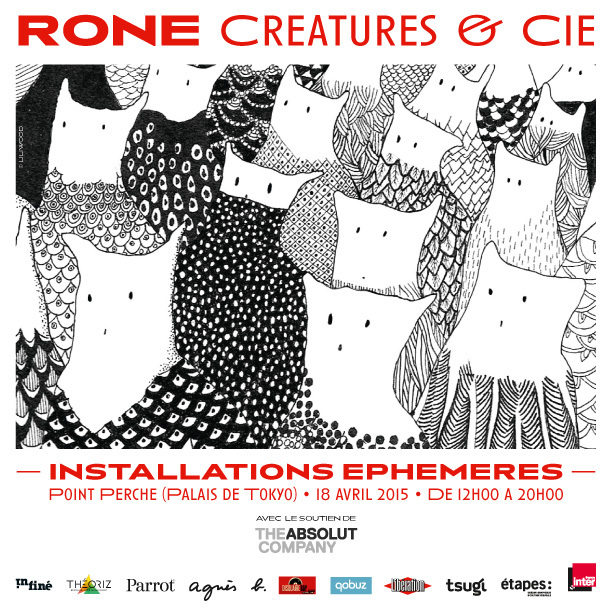 Along with illustrations, photographs, binaural experiences and video games, CoSiMa presented Créatures & Cie – Collective Sound Check, a spontaneous collective performance that enables the audience to play with Rone’s creatures. 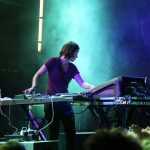 By simply opening a web page, the visitors of the exhibition can discover a novel way of exploring Rone’s musical universe and fill in the space with his sound creatures. 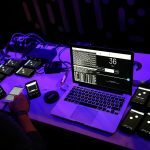 This performance is a first step towards a new generation of interactive musical experiences that Rone is developing in collaboration with IRCAM.